The facts surrounding the psychological effects of color on mood and productivity are fairly well known. However, what effect does color have on our perception of food and our appetites? Keep reading to find out how different hues influence our relationship with food. 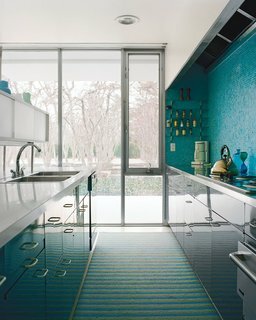 The color blue in kitchens has been noted to act as an appetite suppressant—perhaps the color's calming effect is thanks to its association with the natural elements of the sky or ocean. In fact, some nutritionists suggest using a blue light bulb inside your fridge to discourage mindless snacking. A mosaic tile wall softens the laboratory-like effect of the glossy kitchen cabinets. 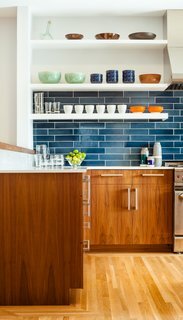 The residents have a particularly strong sense of color and love to cook with their son, so no-fuss finishes likes these blue tiles from Heath Ceramics were an ideal choice. 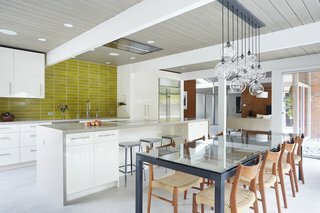 The tiles combine with colorful tableware and custom walnut cabinetry to make a vibrant interior. 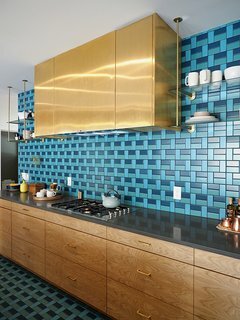 This kitchen, from the 2015 Sunset Idea House, features a pattern of blue & turquoise tiles from the back wall all the way to the kitchen floor. Studies show that your body secretes more serotonin, the feel-good hormone, when you are exposed to the color yellow. It also has the benefit of increasing your appetite, as well as your happiness quotient. Similar to yellow, orange hues elicit feelings of warmth and comfort—think pumpkin pie! The bach was designed with a combined open-plan kitchen, living room, and dining area, for which Gerald designed a dining table that seats ten. 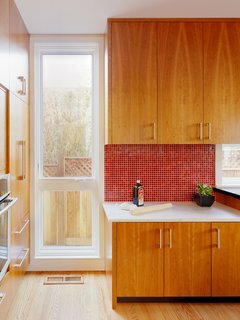 Bare bulbs, open shelves, and bright orange MDF cabinets in the kitchen maintain the low-key vibe. 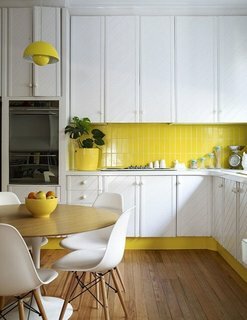 This sunny yellow kitchen successfully mixes vintage charm with mid-century furniture. 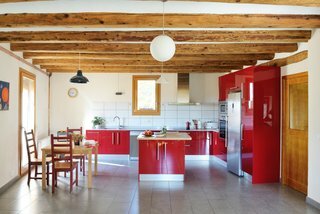 Red-colored foods have been noted to be the most appealing overall, so it's no surprise that red in the kitchen is a popular choice. This color, which is associated with energy and vitality, increases your heart rate as well as your appetite. In this California home by Ogawa Fisher, a red mosaic tiled backsplash balances the lower white marble counter. 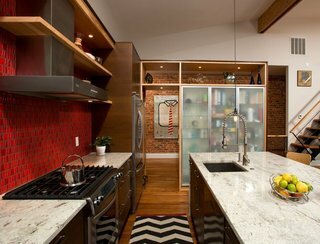 This Washington DC row house conversion maintains an industrial feel courtesy of brick walls, dark woods, and a fiery red backsplash wall. Green is associated with nature and health. Leafy colors bring the outdoors in and tend to add a sense of nutritional value to everything, regardless of its true nature. "This is the Beauvoir House, located in Las Flores Canyon in Malibu," says Bruce Bolander. 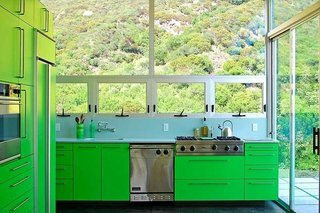 "The color was influenced by the color of the new growth on the chaparral that surrounds the house. The house and kitchen are both very small; the house is about 1600 square feet." 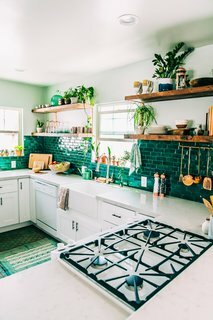 These green tiles are a perfect backdrop for the wealth of potted plants lining the shelves and window sills in this L.A. artist's kitchen. 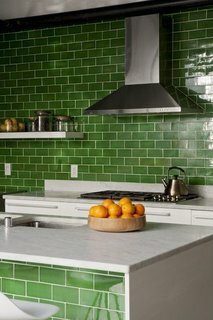 Stem green subway tiles, crisp against white marble countertops, unite this kitchen's island and galley counter. © 2019 Dwell Life, Inc. All rights reserved.